Definition at line 38 of file console.h. Definition at line 50 of file console.cpp. References cmdExitModule(), cmdFlyCam(), cmdGetPCRoom(), cmdListModules(), cmdListMusic(), cmdListRoomsVisibleFrom(), cmdLoadModule(), cmdPlayAnim(), cmdPlayMusic(), cmdShowTriggers(), cmdShowWalkmesh(), cmdStopMusic(), and Engines::Console::registerCommand(). Definition at line 81 of file console.cpp. Definition at line 116 of file console.cpp. References _engine, Engines::KotOR2::Module::exit(), Engines::KotOR2::KotOR2Engine::getGame(), Engines::KotOR2::Game::getModule(), and Engines::Console::hide(). Definition at line 158 of file console.cpp. References _engine, Engines::KotOR2::KotOR2Engine::getGame(), Engines::KotOR2::Game::getModule(), and Engines::KotOR2::Module::toggleFreeRoamCamera(). Definition at line 170 of file console.cpp. 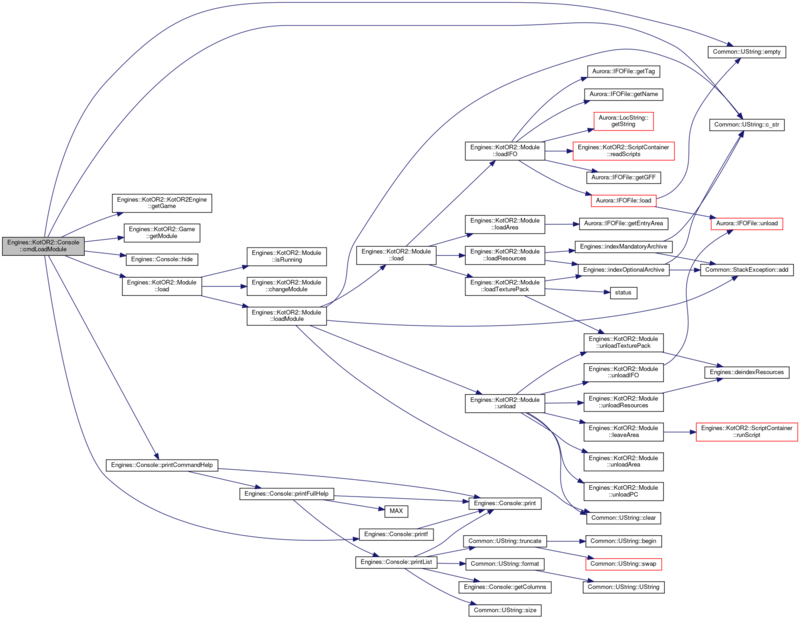 References _engine, Common::UString::c_str(), Engines::KotOR2::KotOR2Engine::getGame(), Engines::KotOR2::Game::getModule(), Engines::KotOR2::Module::getPC(), Engines::KotOR2::Room::getResRef(), Engines::KotOR2::Object::getRoom(), and Engines::Console::printf(). Definition at line 121 of file console.cpp. References _modules, Common::UString::c_str(), Engines::KotOR2::Module::getName(), Engines::Console::printf(), and updateModules(). Definition at line 145 of file console.cpp. References _maxSizeMusic, _music, Engines::Console::printList(), and updateMusic(). Definition at line 175 of file console.cpp. 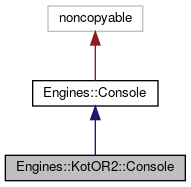 References _engine, Engines::Console::CommandLine::args, Engines::Console::CommandLine::cmd, Common::UString::empty(), Engines::KotOR2::Module::getCurrentArea(), Engines::KotOR2::KotOR2Engine::getGame(), Engines::KotOR2::Game::getModule(), Engines::KotOR2::Area::getRoomsVisibleFrom(), Engines::Console::printCommandHelp(), and Engines::Console::printf(). Definition at line 128 of file console.cpp. References _engine, _modules, Engines::Console::CommandLine::args, Common::UString::c_str(), Engines::Console::CommandLine::cmd, Common::UString::empty(), Engines::KotOR2::KotOR2Engine::getGame(), Engines::KotOR2::Game::getModule(), Engines::Console::hide(), Engines::KotOR2::Module::load(), Engines::Console::printCommandHelp(), and Engines::Console::printf(). Definition at line 188 of file console.cpp. 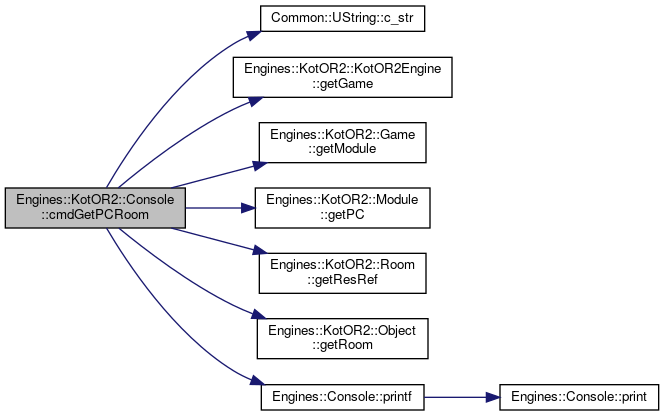 References _engine, Engines::Console::CommandLine::args, Engines::Console::CommandLine::cmd, Common::UString::empty(), Engines::KotOR2::KotOR2Engine::getGame(), Engines::KotOR2::Game::getModule(), Engines::KotOR2::Module::playAnimationOnActiveObject(), Engines::Console::printCommandHelp(), and Common::UString::split(). Definition at line 154 of file console.cpp. References _engine, Engines::Console::CommandLine::args, Engines::KotOR2::KotOR2Engine::getGame(), and Engines::KotOR2::Game::playMusic(). Definition at line 166 of file console.cpp. References _engine, Engines::KotOR2::KotOR2Engine::getGame(), Engines::KotOR2::Game::getModule(), and Engines::KotOR2::Module::toggleTriggers(). Definition at line 162 of file console.cpp. 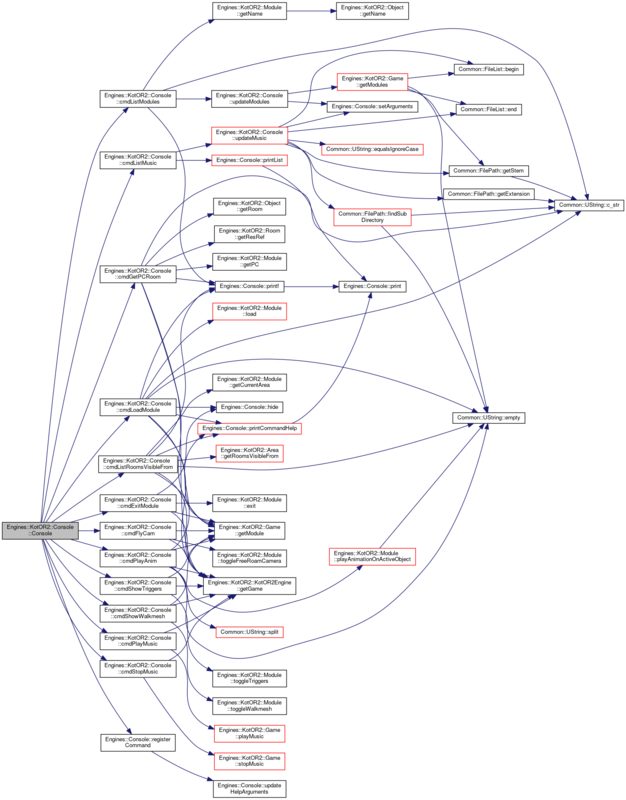 References _engine, Engines::KotOR2::KotOR2Engine::getGame(), Engines::KotOR2::Game::getModule(), and Engines::KotOR2::Module::toggleWalkmesh(). Definition at line 150 of file console.cpp. References _engine, Engines::KotOR2::KotOR2Engine::getGame(), and Engines::KotOR2::Game::stopMusic(). Definition at line 84 of file console.cpp. References Engines::Console::updateCaches(), updateModules(), and updateMusic(). Definition at line 91 of file console.cpp. 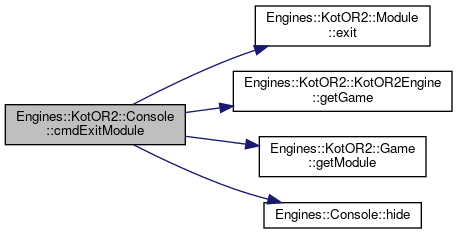 References _modules, Engines::KotOR2::Game::getModules(), and Engines::Console::setArguments(). Referenced by cmdListModules(), and updateCaches(). Definition at line 97 of file console.cpp. References _maxSizeMusic, _music, Common::FileList::begin(), Common::FileList::end(), Common::UString::equalsIgnoreCase(), Common::FilePath::findSubDirectory(), Common::FilePath::getExtension(), Common::FilePath::getStem(), MAX(), ResMan, and Engines::Console::setArguments(). Referenced by cmdListMusic(), and updateCaches(). Definition at line 45 of file console.h. Referenced by cmdExitModule(), cmdFlyCam(), cmdGetPCRoom(), cmdListRoomsVisibleFrom(), cmdLoadModule(), cmdPlayAnim(), cmdPlayMusic(), cmdShowTriggers(), cmdShowWalkmesh(), and cmdStopMusic(). Definition at line 51 of file console.h. Referenced by cmdListMusic(), and updateMusic(). Definition at line 48 of file console.h. Referenced by cmdListModules(), cmdLoadModule(), and updateModules(). Definition at line 49 of file console.h.